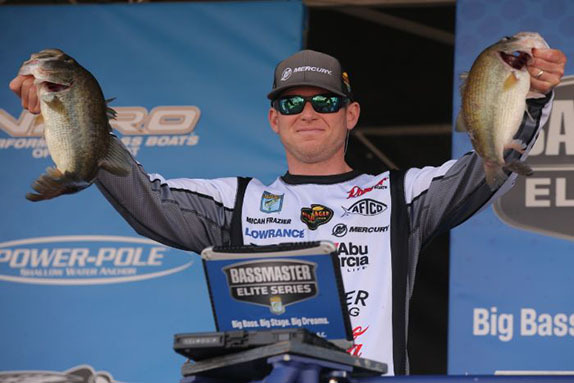 Brandon Cobb led the field at the Lake Hartwell Bassmaster Elite Series for the second straight day. 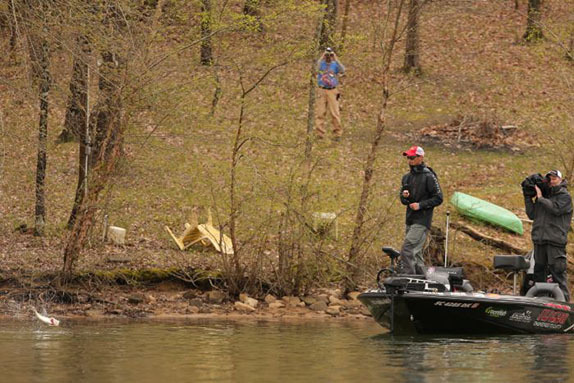 Sight-fishing conditions deteriorated on day 2 of the Lake Hartwell Bassmaster Elite Series, but not to the level that would take the tactic out of play, as some had predicted. Despite an overcast sky that spewed rain for much of the morning, plenty of quality spawning fish got looked at and caught as the third event of the season reached its midway point. 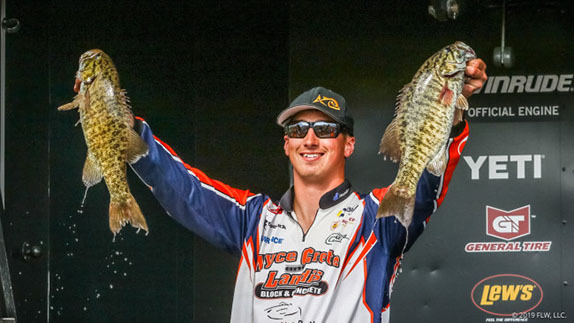 Brandon Cobb, fishing his home lake and sleeping in his own bed each night, maintained his hold on the top position with a 17-08 stringer that gave him a two-day total of 37-01. He'll start the weekend with a 1-05 edge over Micah Frazier, who boxed 18-03 to remain in the No. 2 slot. Drew Cook, a rookie from Florida who's logged finishes of 18th and 12 thus far, caught the tournament's first 20-pound stringer (20-06) and jumped from 25th to 3rd with 34-10. Bill Lowen climbed from 8th to 4th with a 34-03 aggregate (18-03 on day 2) and Hank Cherry slipped from a tie for 2nd to 5th with 31-08 (13-15). The second half of the top 10 consists of Brandon Lester (31-04), Jeff Gustafson (31-01), Matt Arey (30-12), Patrick Walters (30-10) and Stetson Blaylock (30-07). Lester moved up 18 places with a 16-14 haul and Blaylock's bag, just an ounce lighter, gained him 23 slots. 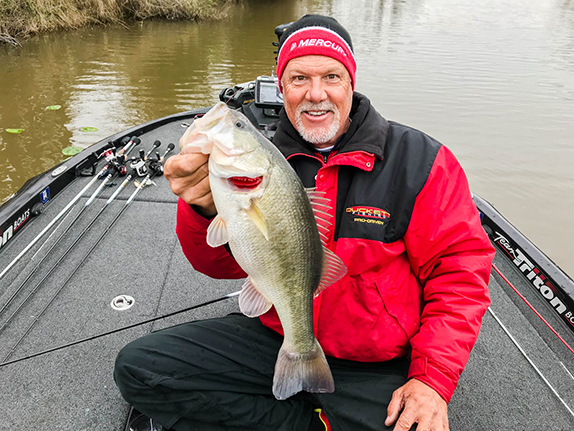 The action was a little tougher overall on day 2 as the weight needed for the 35th-place cut position ended up being 25-11 � a 13-07 bag occupied that slot after day 1. Five competitors in the 74-angler field failed to catch a limit after only two did so the previous day. Despite less-than-ideal conditions, Cobb caught more sight-fish on day 2 than he had the previous day. Only the top 10 will survive Saturday's cut, with the winner determined Sunday based on cumulative weight. Cobb, one of the anglers who'd feared that sight-fishing might be next to impossible once the stormy weather moved in, caught at least four and possibly all five of the fish he took to the scale after ogling them. "Believe it or not, I caught more off the beds today with the crappy weather than I did yesterday," he said. "There weren't necessarily more fish up, but I just did it all day. I caught a good one this morning and said 'Okay, that was easy' and I just kept doing it. I wasn't catching them any other way." His bag was topped by a 5 1/2-pounder that was on a nest with a 10-inch buck. He caught the little male first and the female immediately thereafter. "I think I can catch some more off beds. I basically caught every good one I saw today except one big one I couldn't get to bite. "We're supposed to have sun tomorrow, so I'll do it some and I'll probably fish some docks. I might also try some post-spawn stuff to see if that's happening with it getting warmer, but I'll sight-fish for the bulk of the day as long as I'm seeing some. "Yesterday I ran around to multiple areas, but today I just stayed in one. There's quite a few local tournaments tomorrow and I'm sure some of those guys will be in there, so I don't know if that'll hurt me or not." 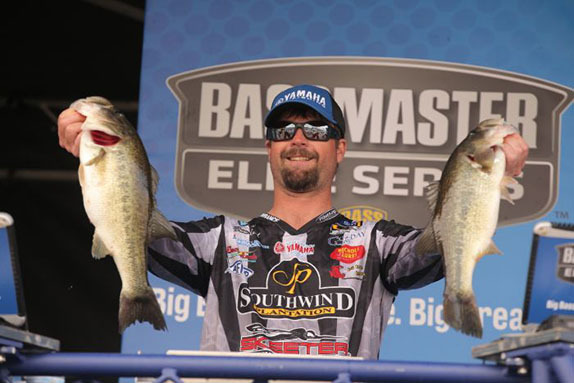 Micah Frazier has surprised himself with his strong showing at Hartwell. Frazier remains surprised that he's faring so well after finding basically nothing in practice. He weighed three sight-fish on day 2 and caught his biggest specimen, a 4 1/2-pounder, while blind-casting. "I moved around a little and caught them from a couple different areas," he said. "I didn't think this was possible once or twice, so maybe I can do it three days in a row � I don't know. "I marked a couple small fish today, but nothing that'll help me tremendously. I caught some from a few pockets today and I'll fish those again, and I'll check a few others also. I think I know now what I have to do to have a chance to win. I'll stay on the move and hope I run into a big one or two like I have each day so far." 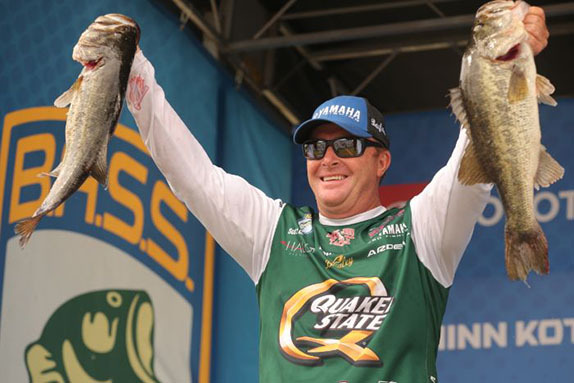 Cook looked at all five of the fish that comprised his event-best stringer. They were all close to the same size � his biggest registered 4-11. "It was a pretty good day � it kind of all worked out considering the way the fish were acting and the weather and all that," he said. "I spent an hour fishing deep this morning and didn't catch any, then I went up shallow. I had some marked and I found a bunch more today. They're still coming to the bank. "I fished clean today and didn't lose any. I lost one yesterday that would've helped." Lowen, a notorious "river rat" who often seeks out the dirtiest water he can find, weighed only one fish that he could see on day 2 � a 3-pounder. He went through more than a dozen keepers and his bag was topped by a 5-05. Drew Cook's 20-pound bag was the first of the tournament. "I fished about the same as yesterday, but I just got some bigger bites," he said. "I haven't hardly seen anybody the last two days and that's always a plus, but I don't know if those areas will reload. I'm having to run and cover a lot of water. "I'll go with the same game plan tomorrow. I've got nothing else." 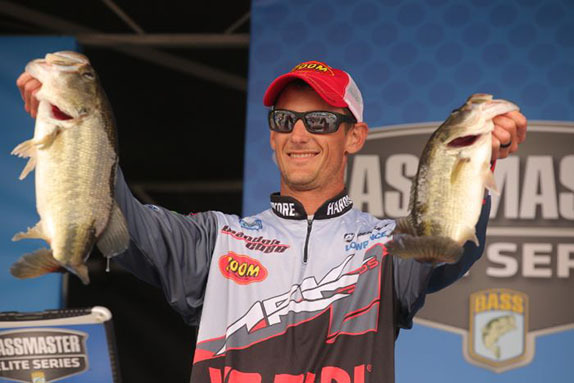 John Crews, who was 7th after day 1 with a 16-09 bag, caught just 10-05 on day 2 and dropped to 25th. He caught one fish that he looked at, but eventually culled it. He had four sight-fish on his opening-day stringer. "I caught the only bed-fish I had yesterday and I caught some in the afternoon just fishing, but the size was a lot smaller," he said. "I mostly just fished today and tried three or four different things, but I never caught any good ones. "I don't know what to do tomorrow, but it's going to be something completely different again. I ran all new water today and I'll go to more new stuff tomorrow and see what happens. > Day 2 stats � 74 anglers, 69 limits, 1 four, 2 threes, 2 twos. > The Elite roster is down one angler this week � Derek Hudnall was disqualified for practicing on the venue during the off-limits period. A B.A.S.S. communications official said Hudnall self-reported the violation.